Jamie here! 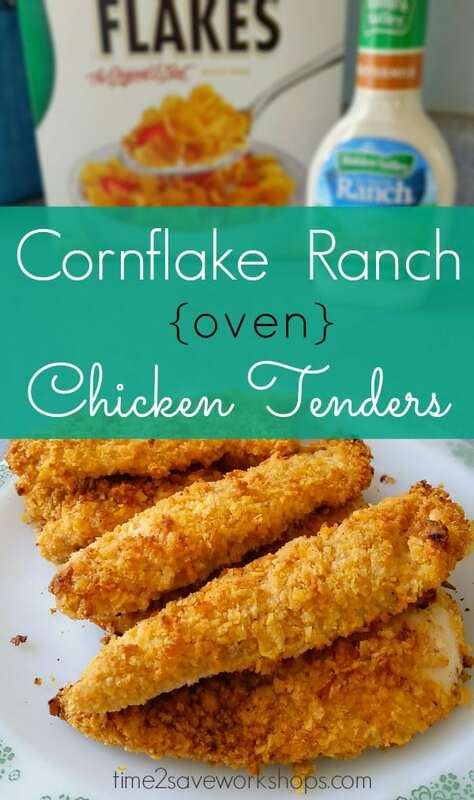 If you’re looking for a healthier and delicious way to make tasty tenders – you’re going to LOVE this cornflake ranch chicken tenders recipe! All you need for this recipe is chicken breast, milk, ranch dressing, cornflakes, and whatever seasonings float your boat. If you have that, you’re ready to roll! First, cut your chicken breasts into strips. A nice sized breast should yield about 3 strips. Set all of these aside and go ahead and preheat the oven to 425. Pour about a cup of cornflakes (Yes cornflakes – NOT corn chips!) into a Ziploc bag and have one of the munchkins roll a can of green beans back and forth on it until they’re crushed into tiny teeny pieces. Meanwhile, you can get the ranch dip ready! Fill a cereal bowl about 1/3 of the way with milk and add three or four tablespoons worth of Ranch dressing. The ratio is really an eyeball kind of thing – no need to be exact about it. You just want to end up with ranchy milk. Using a fork (or your fingers) dip each tender in the milk bath and then press it into the cornflake coating. Make sure it’s covered well so the chicken won’t dry out in the oven. Place tenders on a cookie sheet that you’ve liberally sprayed with nonstick cooking spray. 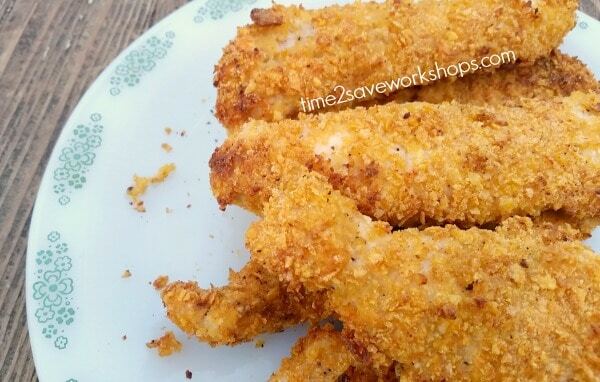 Spray the tops of the tenders as well – to help the them get a nice golden color as they bake. *If you have a lot of chicken, say more than a couple breasts, you’ll probably need to refill your cornflake coating and ranch-milk about halfway through. I like to do a TON of chicken at a time so we can use it for lunches during the week – so I refilled my bowls a few times. Baking time will depend on how big your tenders are, but mine always take about 20 minutes. If you feel unsure, just cut into the thickest one to do a spot check. With my hubby trying to lower his cholesterol, and my kids wanting nothing but chicken nuggets and cheeseburgers – this was a yummy compromise that everyone in our house loved! Let me know if you shake it up any – or go Southwest – I’ll have to try that version next! Fill a cereal bowl about 1/2 of the way with milk and add dressing. Dump the cornflake crumbs from the bag into a separate bowl and stir in the seasonings you like. Using a fork (or your fingers) dip each tender in the milk bath and then press it into the cornflake coating. Make sure it's covered well so the chicken won't dry out in the oven. Place tenders on a cookie sheet that you've liberally sprayed with nonstick cooking spray. Spray the tops of the tenders as well - to help the them get a nice golden color as they bake. Can I use bone in chicken breasts?